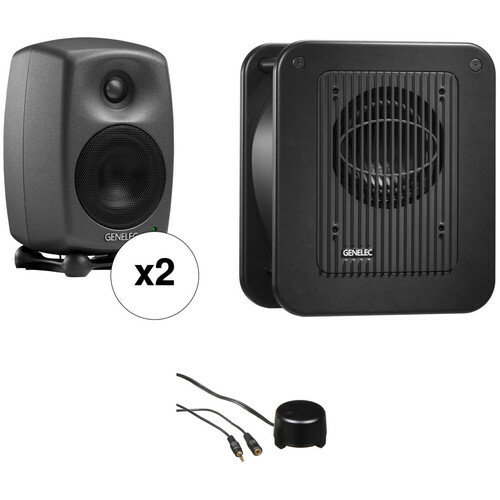 Upgrade your home setup, project studio, or broadcast/production suite with this B&H Kit, which includes a pair of Genelec 8020 Bi-Amplified Active Monitors, one Genelec 7040 Studio Subwoofer, and a compact stereo volume controller. With a 4" woofer, a 3/4" metal dome tweeter, and two Class-D power amplifiers in an aluminum low-diffraction enclosure, each monitor provides a frequency response of 62 Hz to 20 kHz. The subwoofer's 6.5" driver and Laminar Spiral Enclosure technology enable it to handle low-frequency reproduction from 30 to 85 Hz. Thanks to a small footprint and full-spectrum sonic bandwidth, this kit is ideal for use in recording, editing, and mixing environments where space is limited. Styled in what the manufacturer has dubbed a "Producer Finish", and now utilizing Class-D amplification, the Genelec 8020D Active Two-Way 4" Studio Monitor provides an accurate reproduction of the source material in a compact form factor. Its die-cast aluminum enclosure features a rounded shape, which minimizes frequency and reflection distortions caused by edge diffraction. The metal dome tweeter is surrounded by Genelec's Directivity Controlled Waveguide, which helps to create an even response when listening both on and off axis. The 8020D is built with Intelligent Signal Sensing (ISS) technology, which automatically activates the speaker when an audio signal is detected and puts it in standby mode when no signal is present, reducing its energy consumption to less than 0.5W. The 8020D features a 50W high-frequency amplifier for its ¾" tweeter, and a 50W low-frequency amplifier for its 4" woofer. The bass response is expanded by a rear-facing reflex port, and a separately available Genelec subwoofer can be used to monitor a wider array of frequencies. Offering a professional and reliable low frequency reproduction system in a transportable package, the Genelec 7040A is the ideal to complement Genelec 8010 and 8020 monitors. It extends the low frequency response down to 30 Hz and uses Genelec's patented Laminar Spiral Enclosure (LSE) technology, which provides precise bass articulation and extended low frequency capacity. This stereo subwoofer system can produce 100 dB of undistorted SPL using a 6.5" woofer, and a powerful Genelec-designed Class D amplifier. With its small footprint, the 7040A is a subwoofer solution for recording and composing/project studios, mobile vans and portable recording systems. The 9000A Stereo Volume Control (Mystic Black) from Genelec is a compact stereo volume control unit that provides convenient volume control for all Genelec loudspeakers. The control has a Y-style cable that splits into standard 3.5mm male and female connectors for audio input and output, providing compatibility with a variety of computers, MP3 players, gaming devices, and more. Note: A converter cable (sold separately) may be needed for connecting to equipment that has RCA and/or XLR connectors. Box Dimensions (LxWxH) 14.9 x 8.0 x 7.5"
Box Dimensions (LxWxH) 20.0 x 16.0 x 11.0"
Box Dimensions (LxWxH) 4.55 x 4.4 x 1.85"